Daily Illuminator: Andrew Hackard Will Be At Tupelo Comic Con! March 31, 2017: Andrew Hackard Will Be At Tupelo Comic Con! Have you always wanted to meet Munchkin Czar Andrew Hackard? (You must be a glutton for PUNishment!) If you're near Tupelo, Mississippi, you'll get your chance this weekend! Andrew is a guest at the Tupelo Comic Con, being held at the Tupelo Furniture Market – we're guessing game tables won't be a problem! Andrew is scheduled to talk about Munchkin, SJ Games, and the game industry in general. He's also going to help with the Munchkin tournament run by our Men In Black. And he'll be hanging out in the game area showing off some games . . . including an early peek at Munchkin Shakespeare! 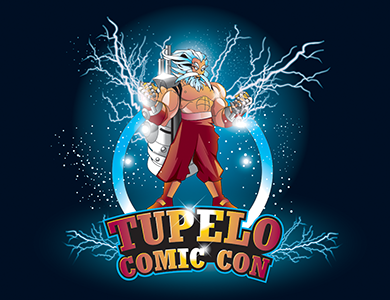 Tupelo Comic Con runs April 1 and 2.